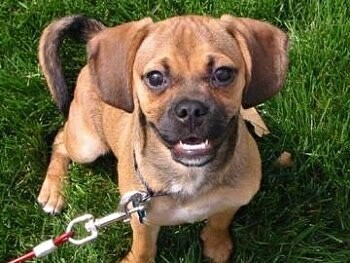 "Jack is our Puggle at 2 years old, who weighs in at a hefty 27 pounds. Jack got his name because when we first met him, he crawled into my husband's jacket and went to sleep. Joking, I suggested, "If we got him we could call him Jack..." and so it went. Jack is a people-dog (similar to a people-person). 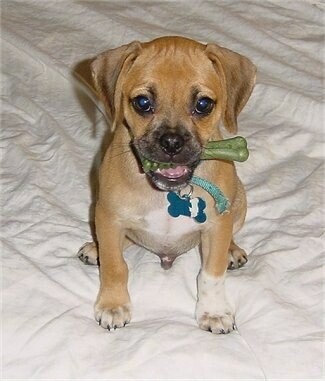 Jack loves running in his backyard chasing the rabbits with his toy dinosaur in his mouth. (The dino is his favorite toy, and has been replaced 3 times due to how much he LOVES it....) Jack's favorite pastime is chewing on socks. When we first got him we noticed that he'd go into the laundry basket, and only pull out my husband's socks. This prompted us to be more cautious of where we placed the laundry, but also sparked my curiosity. "Would he go after my socks?" and the answer was a declarative no. Only the smell of my husband's smelly feet. As with most households, you typically have loose socks (even though you swore you put a pair in the washer, when it’s all done, you are down one sock.) Because of this, Jack now has a steady collection of socks for his enjoyment. He will run around the house happier than a pig in you-know-what, with his sock in his mouth. After many variations of socks, we've learned that tube socks last the longest." 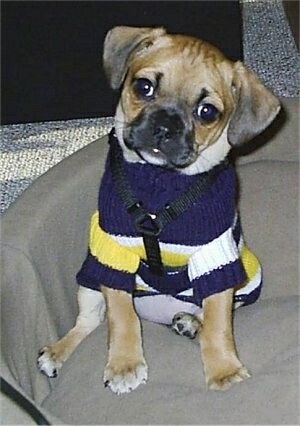 Puggle puppies (Pug x Beagle mix breed dogs) Copper and Digger (fawn color) are 7 weeks old in this picture. They are both male and are from the same litter.